The storage dons at SanDisk have developed the world's heftiest SD Card, with the new card touting an incredible 512GB capacity. The new SanDisk Extreme Pro card is being targeted at industry professionals who'll be using the gear to record 4K footage. "4K Ultra HD is an example of a technology that is pushing us to develop new storage solutions capable of handling massive file sizes," explains Dinesh Bahal, SanDisk's VP of marketing. Ultra high definition imaging takes up an immense amount of storage space (obviously), and lengthy shoots can eat up huge amounts of memory very quickly. SanDisk reckons its latest card is great for 4K and full HD shooting, as well as high-speed burst mode photography. "As an industry leader, SanDisk continues to push the boundaries of technology to provide customers with the innovative, reliable, high-performance solutions they have come to expect from us," says Bahal. 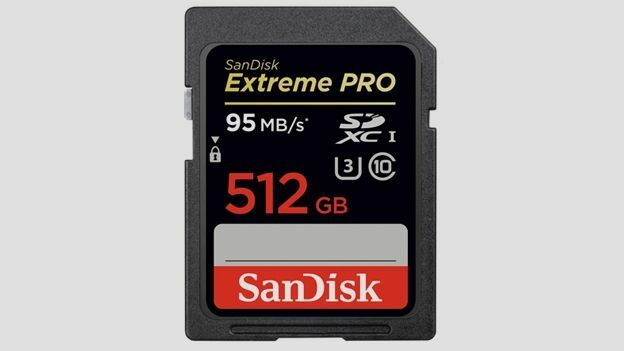 "The 512GB SanDisk Extreme Pro is a tremendous advancement that enables professionals to reliably store more content on a single card than ever before." It's worth noting that in 2003, SanDisk showed off its first 512MB SD card - that's a 1000x storage leap in just north of 10 years. Despite the boost, SD Cards are still very, very small, which makes the huge capacity even more impressive. The new card will offer write speeds of up to 90MB/s and transfer speeds capping out at 95MB/s. They're also surprisingly rugged, with SanDisk promising shockprock, X-ray proof, waterproof cards that can run in temperatures between -13 to 185 Fahrenheit. SanDisk's 512GB Extreme Pro is available worldwide right now, although it'll cost you a staggering $799.99 - that's about £492. In other ridiculous storage news, TiVo launched a new digital video recorder this week - the Mega - that boasts a 24TB capacity. Check out the fully story right here on T3.com.